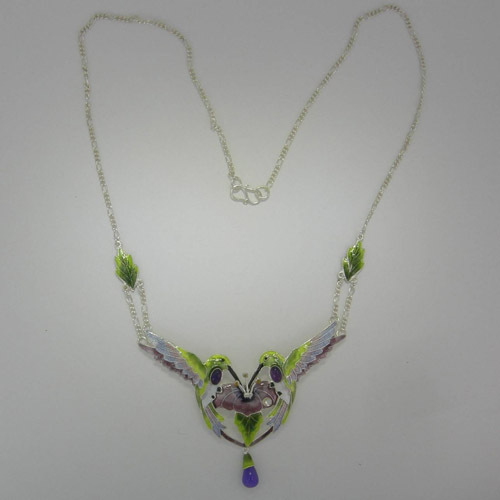 Desc: Sterling Silver Enamel Amethyst Hummingbird necklace. The chain is Sterling Silver Figero link and has an S shaped toggle clasp. The pendant is fashioned to resemble two Hummingbirds drinking necter from a flower. Two Figero chains link the Hummingbirds to Sterling Silver enamel leaves. The Hummingbirds have purple and green and white and black enamel mounted. 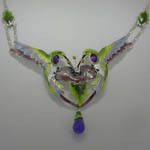 One oval cabochon cut Amethyst is bezel set in the chest of each Hummingbird. One cabochon briolette Amethyst is mounted at the base of the pendant and hangs freely. One clear crystal is bezel set as a drop of dew on the flower petal. The necklace has a bright polish finish.